Sending our little loves to dreamland is part of our everyday routine as a mother. Sleeping is a normal part of the day but letting our babies sleep is not just enough because we need to look into the importance of safe sleeping habits. When I had Bella, I was afraid of SIDS or Sudden Infant Death Syndrome because I heard that babies less than a year old would die sleeping without even knowing the real cause of it. That is why it is called "syndrome". I would always check her when sleeping, listen to her heartbeat, feel her breathing and all. I was a paranoid mommy. But hey, who wants to lose a baby? No one! Happily, my paranoia ended because Bella was actually alright - healthy and lively. How about the other babies? Are they all sleeping safely? Sad to say, some are not especially that there are parents who are not educated about this. Awareness is always key but who would inform parents if the government isn't doing anything? There are many ways to help. Blogging is just one way to do that. This October is SIDS Awareness Month. Halo Philippines, the local distributor of the Halo SleepSack wearable blanket, amplifies its campaign to spread the word about safe sleep. Along with fellow safe sleep advocates, Pink Heart String hopes to start a yearly tradition of promoting safe sleep for the continuous education of parents. The Centers for Disease Control and Prevention defines the dangers that may steal the lives of our precious little ones. Sudden Unexpected Infant Death (SUID): The death of an infant that occurs suddenly and unexpectedly. After a case investigation, these deaths may be diagnosed as suffocation,asphyxia, entrapment, infection, ingestions, metabolic diseases, cardiac arrhythmias, trauma(accidental or non-accidental), or SIDS. Sudden Infant Death Syndrome (SIDS): The sudden death of an infant that cannot be explained after a thorough investigation is conducted, including a complete autopsy, examination of the death scene, and a review of the clinical history. SIDS is a type of SUID. 1. Suffocation by soft bedding—such as a pillow or waterbed mattress. 2. Overlay—another person overlaying or rolling on top of or against the infant. 4. Strangulation—such as when an infant’s head and neck become caught between crib railings. 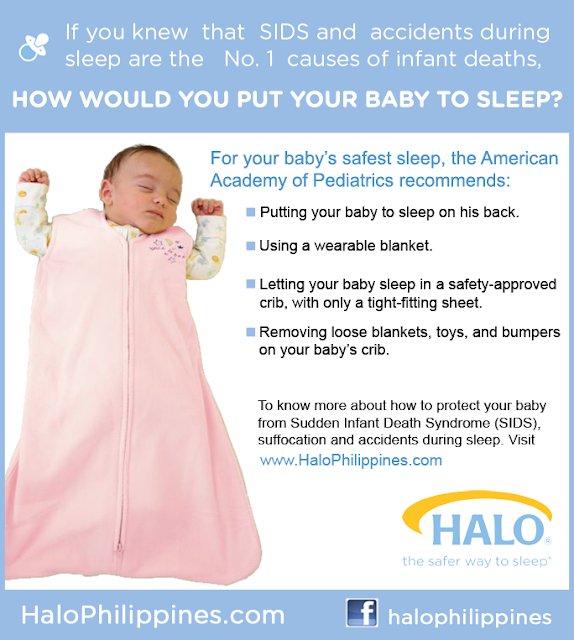 In support of SIDS Awareness Month, Halo Philippines has put together this public service reminder on safe sleep. I never heard of these SleepSack before and when I saw the picture, I was kinda curious on how this thing works. But as I researched about it, I found out that it can be good for our babies and could keep them safe while sleeping. Created by a parent who lost a child to SIDS, the award-winning Halo SleepSack is a wearable blanket that eliminates the risk of a baby getting entangled with clothing and loose bedding during sleep. It is worn over pajamas or a t-shirt in place of loose blankets that can easily be kicked off, thus ensuring a better night’s sleep. It is the safer way to sleep. Halo is the No. 1 wearable blanket in the market today. Its name has become synonymous to quality and safety that translates to value for money. In fact, Halo is the only brand trusted and used by over 1,200 US hospitals and NICUs, and is consistently voted by parenting authorities as the No.1 baby must-have. With sizes for newborns up to 5 years old, babies can grow with Halo and experience safer, healthier sleep, which in turn promotes physical and mental development. As a special treat for my blog readers, Halo Philippines is giving 15% discount on all Halo SleepSacks for the entire month of October until November 15, 2013! Just key in my blog name under “customer instructions” when you check out your order at Halo Philippines. • Click the “Facebook” Share button at the bottom of this post. It would be very devastating for a parent to find her child on an undesirable state while sleeping. So, let us do something. If you have shown your support, we really appreciate it. I LOVE LOVE LOVE Halo sleep sacks! Halo sleep sacks are great, obviously the safety factor is most important but they are also great for children who are active sleepers because they keep them warmer because they stay covered up. I think the biggest one for me and it always has been is the worrying about warmth. Trying to keep them warm at night not thinking about the possibility of over heating them. We love Halo around here! Nothing keeps a child as comfortable while sleeping than a SleepSack, and I love that there is no need for loose blankets when my daughter is wearing one of these. We have the sleep sack for toddlers and love it. I never had one when she was little, but I did give one to my husband's cousin and she loved hers. I loved using these with my son! SIDS is so devastating to read/hear about. I am happy to see there is so much education now about how to prevent it!